← Llangollen and the Pontcysyllte Aqueduct. 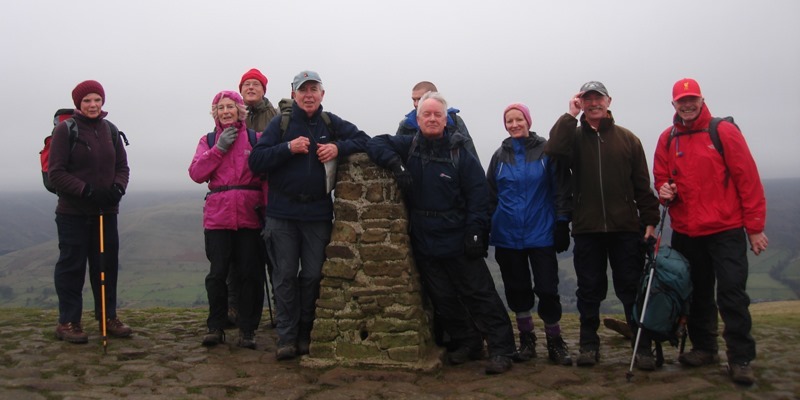 Yesterday I was out with Crosby Rambling Club when we visited Castleton and walked along Great Ridge. This ridge separates the carboniferous limestone of the White Peak from the gritstone of the Dark Peak to the north. 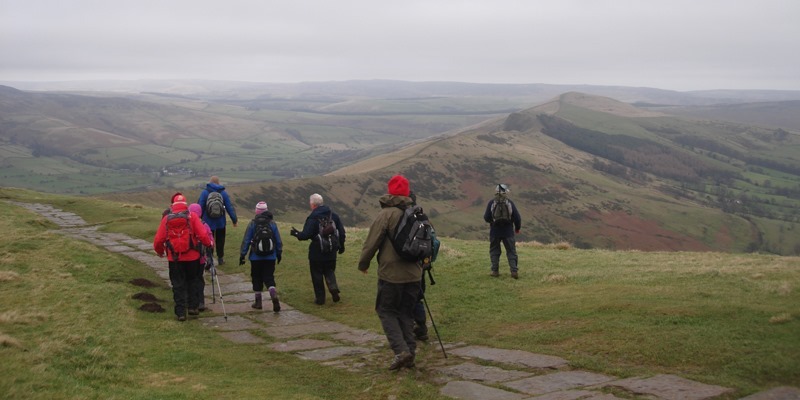 The ridge extends for about four miles from Lord’s Seat in the west to Lose Hill in the east taking in the tops of Mam Tor and Back Tor along its crest. 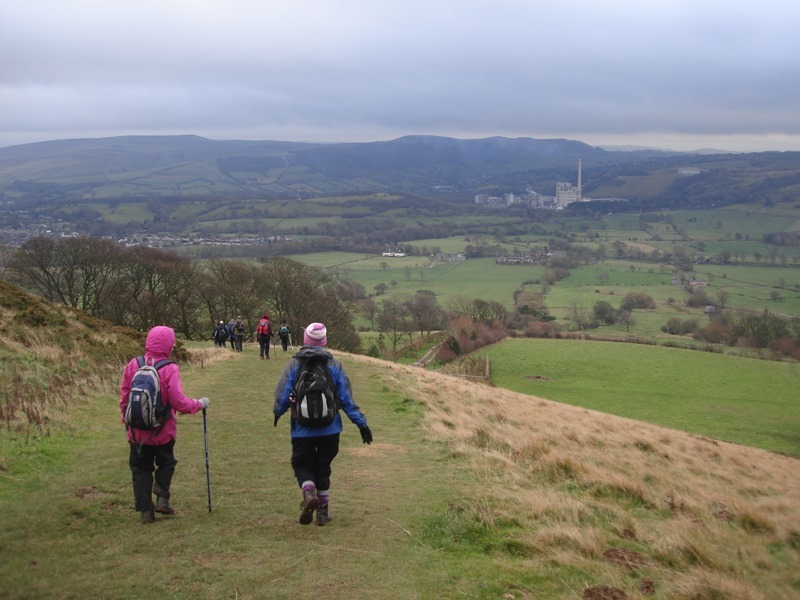 We were doing a 10 mile circular route from Castleton including the best bits of the ridge. It was a murky day, hopeless for photography and we were expecting to get wet. 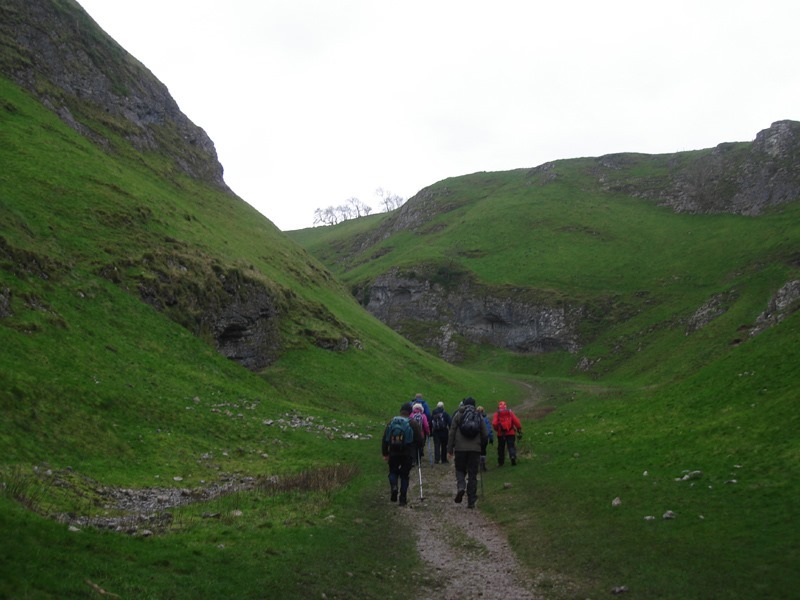 We started our walk from the centre of Castleton and passed through the narrow entrance into Cave Dale. 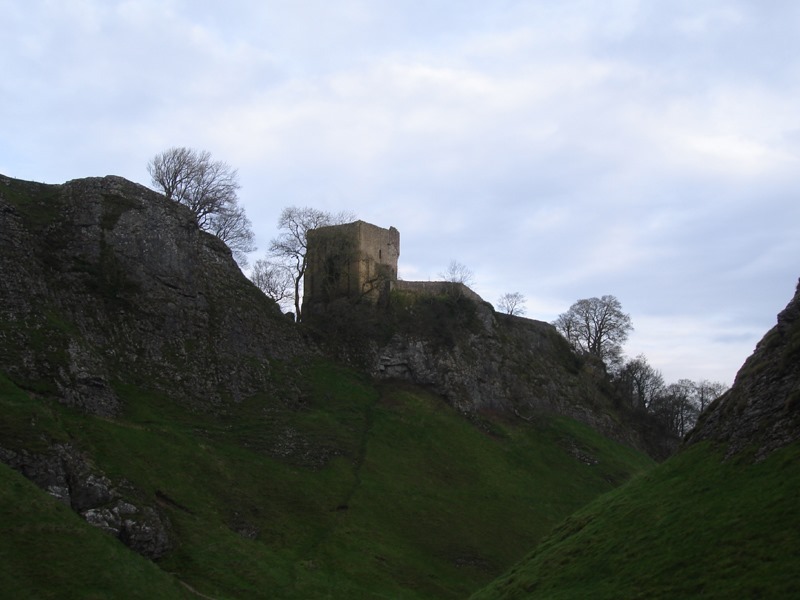 Our path followed the Limestone Way and perched above us on the edge of the crags was Peveril Castle. This castle was founded after the Norman conquest in 1066 by William Peveril. The structure was added to in the 12th and 13th century but has been a ruin since the early 1600’s. Emerging from Cave Dale we followed bridle ways heading towards Windy Knoll and Mam Tor. 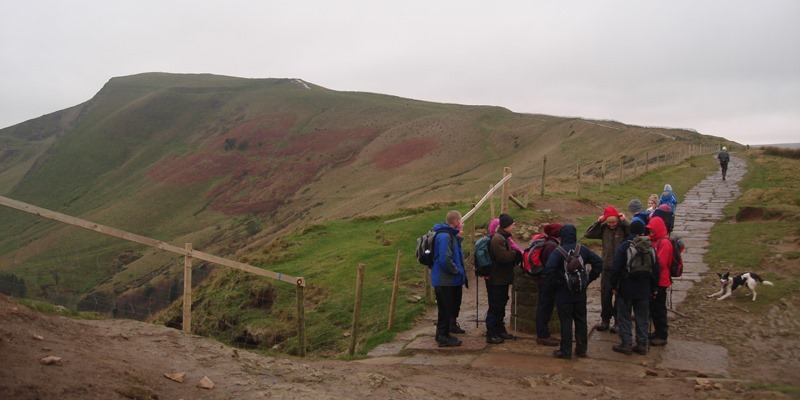 The climb to the top of Mam Tor was short but steep but there were good views from the top looking down into the Edale and Hope valley. 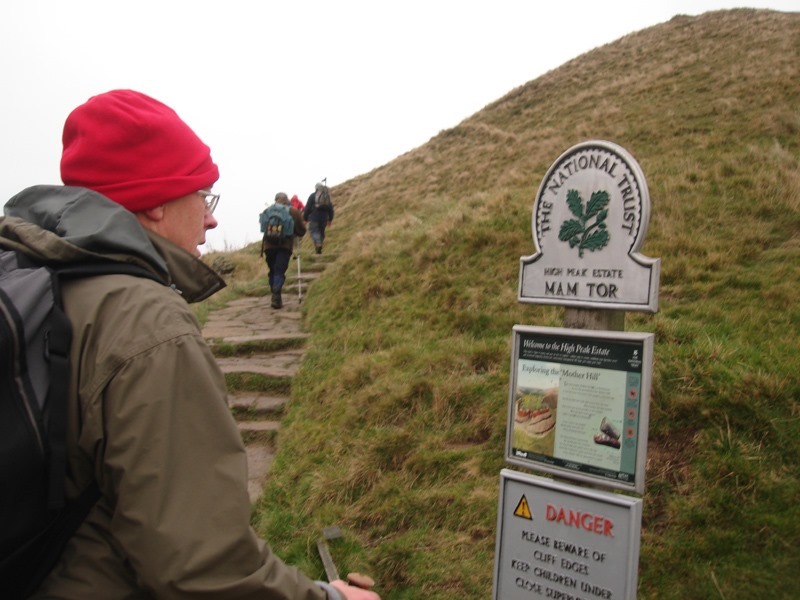 Mam Tor is known as the ‘Shivering Mountain’ It is composes of horizontal bands of sandstone and soft mudstone. Rain, frost and wind eat at this unstable layer cake and periodically cause landslips. In 1979 the hairpin on the A625 below Mam Tor buckled and fell away leaving the road beyond repair. To the north we could see the outline of Kinder Scout looking very bleak and surrounded in mist. We continued along Barker Bank towards Back Tor, another steep climb before our final push up to Lose Hill 1563 ft – 476m. It was then downhill all the way along very muddy field paths back to Castleton where we were able to enjoy an excellent pint of Young’s bitter in The George before heading back to the coach. Tonight we were due to have our Christmas meal at the Beehive Inn . 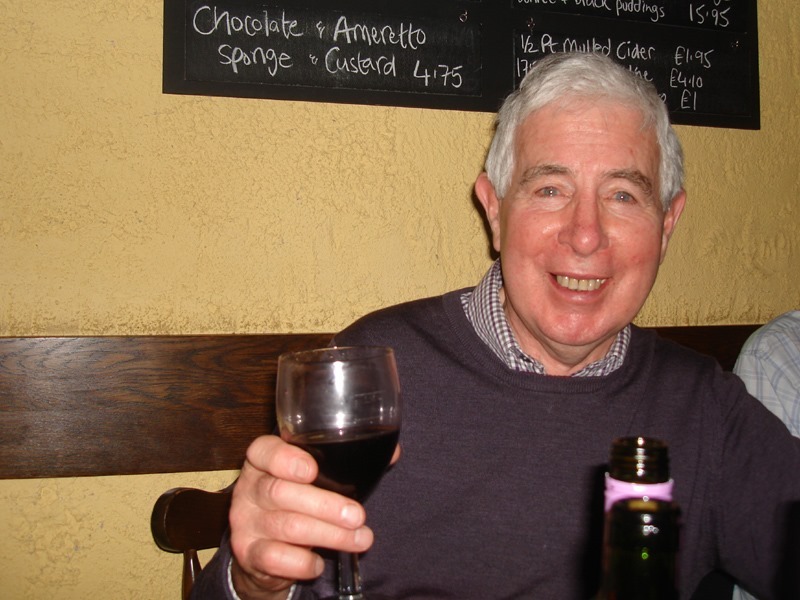 Situated in the village of Combs in the High Peak we had an excellent meal. Service and the food were both first class and everyone had a good time. 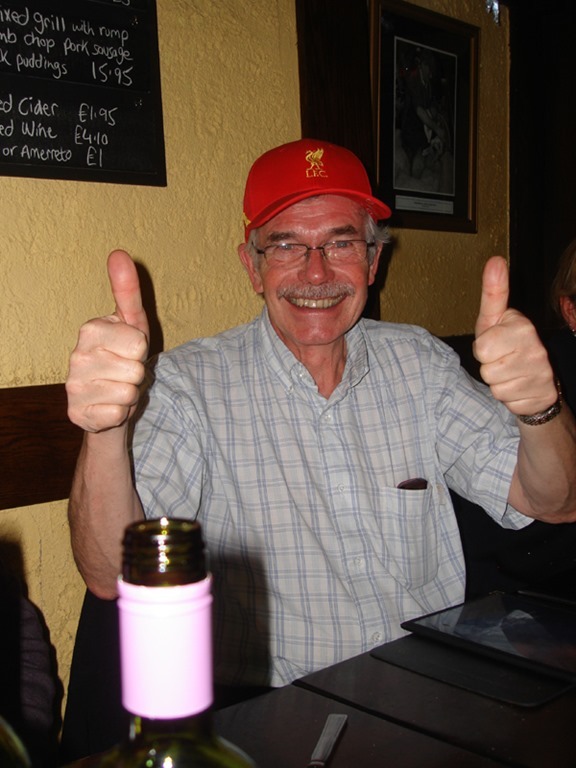 Davis seemed to enjoy himself and Jim was delighted when he heard that Liverpool had just scored another goal in their 5 –0 thrashing of Spurs. Only 10 mile but it seemed like much more. I needed some Rioja with my meal to recover.